A pleasant day-trip for hikers staying at the Inn on Mill Creek B&B is a drive and hike to Mount Pisgah, off of the Blue Ridge Parkway southwest of Asheville. Mt. Pisgah (and Pisgah National Forest where our B&B is located) gets its name from the Bible, where it is listed as a notable mountain peak. 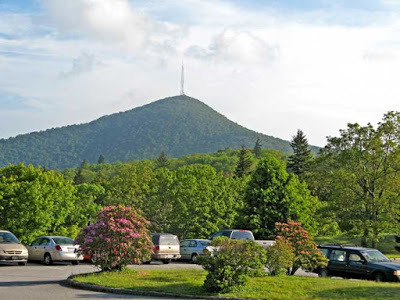 The Mount Pisgah near Asheville, NC, is also quite prominent, standing more than 5,700 feet above sea level. It’s pretty easy to point out from several locations around Asheville, including Biltmore Estate, where visitors could (and still can) view the prominent peak from Biltmore House’s loggia. To get to Mount Pisgah, you’ll want to take the Blue Ridge Parkway, a scenic byway through the mountains. There are multiple entrances onto the Blue Ridge Parkway around Asheville — we usually recommend getting on the Parkway at the entrance closest to our B&B, near Milepost 382 (the Folk Art Center in East Asheville at Highway 70). That entrance is about 20 minutes from the Inn. From there, travel south on the beautiful Blue Ridge Parkway about 30 minutes to Milepost 407.6, which is the parking area for the Mount Pisgah trailhead (use the second parking area). Note: Just beyond the parking area is the Pisgah Inn, a great place for lunch or dinner after your hike! The hiking trail to Mt. Pisgah is roughly three miles round-trip, and is always described as “rocky and steep,” so plan accordingly in terms of what you wear on your feet. You’ll be climbing more than 700 feet over 1.5 miles; the second half is the steeper part. In addition, since Mt. Pisgah is above 5,000 feet in elevation, temperatures are typically cooler than in the Asheville and Black Mountain area — you may want to wear layers if hiking in the morning, even in summertime. The hike will take you through hardwood forest to the summit of Mt. Pisgah. There, you’ll find a transmission tower for a local TV station, and some amazing 360-degree views of the mountains, including the Great Smokies, Cold Mountain, Shining Rock Wilderness and Mt. Mitchell in the distance. For a great description of this hike, check out the following link: www.hikewnc.info/besthikes/blue-ridge-parkway-section-5/mount-pisgah. This entry was posted in Blue Ridge Parkway, Hiking and Waterfall Trails and tagged Blue Ridge Parkway, hiking, outdoors, Summer by Inn on Mill Creek. Bookmark the permalink.